I have a hard time watching comedies by myself. I’m uncertain as to where this comes from. I’m not one to shy from a terrible pun, a laugh, even a poorly-run improv performance. I like funny things. But for personal enjoyment, when it comes to consuming media, my choices run a fairly narrow gamut. I’ll watch a Chinese action movie for the thousandth time, I’ll revisit a childhood cartoon series, but I have a hard time working up the mettle for 21 minutes of sitcom. Things weren’t always like this. In grad school, I had a part-time job at the medical campus, and in office lulls I’d plow through a few episodes of 30 Rock. I love a good Seinfeld bit. Occasionally, I even get an urge to sit through an entire episode of Saturday Night Live. But those are all programs I enjoyed with other people. I watched Seinfeld with my family growing up (it’s constantly on at our reunions). 30 Rock was a college love, something that let us festoon one another with catchphrases from the show and dream of Alec Baldwin as our dad. SNL was my mom’s favorite thing to do on the weekend, although when the jokes turned a little blue, that was it –TV off and time for bed. Somewhere along the line, I lost the ability to sit by myself, turn on something funny, and laugh by myself. Parks and Rec gave that back to me. I don’t know what happened. I’ve watched a few random episodes over the years, and enjoyed it, shared in the fun with friends who love it, but never felt that I needed to commit and watch the whole thing. But I turned it on this past week and just started digging in. It’s healing. It’s wholesome. More importantly, it’s fun. Nearly ten years after season one debuted, there are some things about it that dizzy the mind. Gay marriage hadn’t been legalized in 2009, so Leslie Knope’s penguin ceremony certainly had quite a more substantial impact then than it does today. And yet, it still resonates, it still feels topical and current. Marcia, the foe of the married penguins, could easily be a stand-in for any other right-wing hate group member with an axe to grind about local government. Just because the issue has been legalized by the Supreme Court doesn’t mean we’re done with the conversation about gay marriage – if anything, it’s more polarizing than ever. The same comes up, of course, with Aziz Ansari and #MeToo. 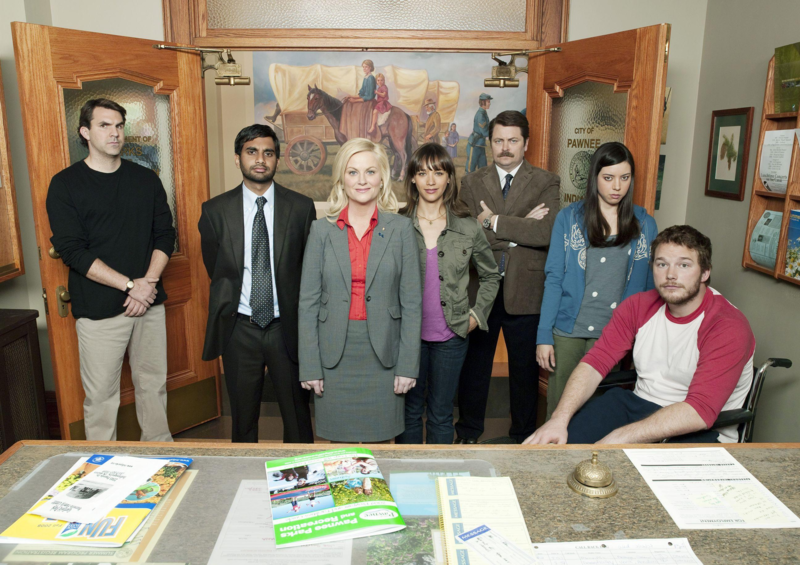 Louis CK’s arrival in season two will prompt similar discussion, I have no doubt, but in the wake of the sexual abuse allegations against more than 100 male celebrities, two things keep recurring for me in Parks and Rec. The first is this lingering sensation of “oh…we should have seen it coming.” Tom Haverford is aggressively sexual in every unwanted and inappropriate way imaginable. Whether or not this telegraphed his terrible actions in January, it certainly colors his character and his real self in a foreshadowing, eerie sort of way. The second thing is how far we’ve come as a society since 2009. Gay jokes, transphobia, casual racism and more-than-insinuated jokes about terrorists have taken a fairly sharp downturn. They don’t seem as prevalent, and if they do turn up, they seem to be quashed by an overwhelming sense of embarrassment, shame, the sense that they don’t belong here, and they didn’t really belong in the past, either. Aziz’s – let’s call a spade a spade, damn it – downright creepy portrayal as Tom as a married, lecherous hump, is not always as funny as it is disgusting. The idea that he’s secretly a nice guy, that it’s all a massive act, has yet to be established. I have hope that when that does occur, it will feel good. But the realist in me knows that it will feel like a cover-up, unearned and unwanted. This is all such a shame, too, because there are so many bright points to the show. The majesty that is Ron Swanson, the embodiment of earnestness that is Leslie Knope, the bizarre cast of townies that people Pawnee – there’s a ton of cool stuff packed into Parks and Rec, so much that I almost can’t believe this show took off the way it did. Sheer volume doesn’t always work for a sitcom (certainly not for its producers), but the show learns from The Office and works hard not to make the same mistakes. It takes pride in its jokes and isn’t afraid to go over the top. Critical receptions of season one notwithstanding, it is still the first look at a show that bold, brave and ready to launch. So, watch as I dive into season 2 of Parks and Rec with all the jaded, hurt feelings of the last decade on my shoulders, and struggle to become comfortable with the sound of my own laughter. Just as much as I am entertained by the show, I hope you find some fun in my experience.